Driving, when associated with children in any way, is usually considered to be quite a dreadful experience by many parents. Since babies and smaller children require constant attention, they put parents in a tough position. Not only do they have to drive the car but also care for their child simultaneously. Fortunately enough, parents are given a chance to make their driving experience more bearable by installing the appropriate seatings for their children. We’ve taken a look at some of the more popular choices on the market and reviewed them. In this review, however, we’ll focus on one car seat only. 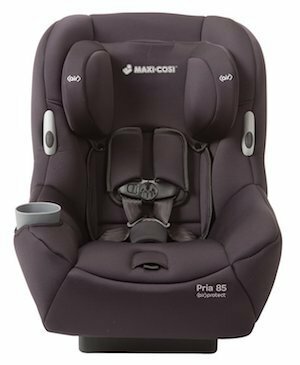 We’ll list the reasons why that seat made it to the group of Maxi Cosi Pria 85 Reviews. What is a Children's Car Seat? It’s a car seat that has been designed to protect your children from various injuries, and even, death. The seats are usually installed separately, although some car manufacturers decide to integrate them directly into their vehicles. 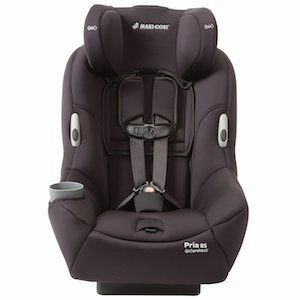 Maxi-Cosi Pria 85 is one of the convertible car seat models, for which the company is well known. In comparison to other Maxi Cosi models, it can definitely handle heavier children better. The seat can hold up to 85 pounds (40 when rear-facing and 85 when forward-facing) and is extremely sturdy and durable. Rear-facing weight range goes from 5 to 40 pounds while its height reaches 40 inches. Forward-facing weight range goes from 22 to 85 pounds while the height reaches 52 inches. The seat itself weighs around 18 pounds and is 11 inches wide and 13 inches long. Keep in mind, however, that its width and height can reach up to 20 and 26 inches when everything is fully extended. 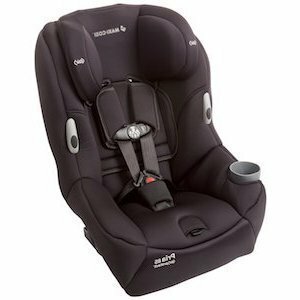 Increased Comfort and Modularity: The benefits of this car seat come in the form of an increased aspect of comfortability and modularity. The seat offers a lot of adjustable elements which can suit both infants and older children. Moreover, you don’t need to worry about whether it will fit your car or not. The size of the seat can vary based on your adjustments. The fact that the seat uses new Air Protect technology in its head cushions and paddings attests to how comfortable the whole seat is. Easy Maintenance: As far as maintenance and cleaning are concerned, everything is modular and removable. There are multiple latches that firmly hold each part and allow for easier cleaning by removing and cleaning them separately, one by one. 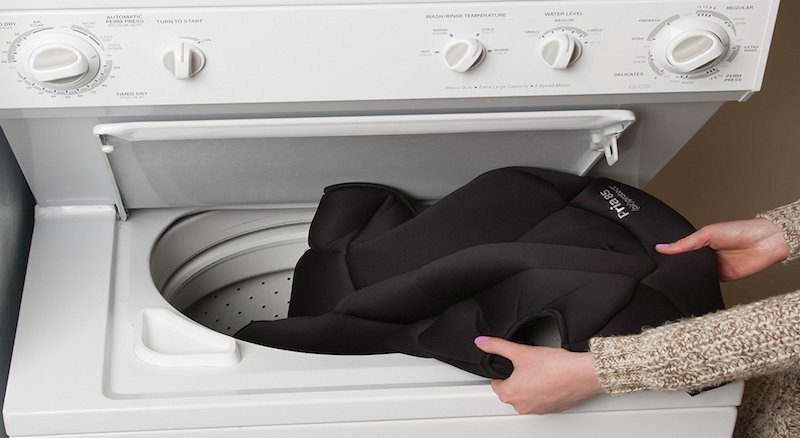 The whole cover is machine washable and can be used in any dryer. There is a lot more that Maxi-Cosi Pria 85 offers than meets the eye. We’ll take an in-depth look into each of these features by reviewing them down below! Maxi-Cosi Pria 85 features a ‘’FlexTech’’ construction in its frame. What that essentially means is that it allows both flexible and rigid parts to accommodate different kinds of car impacts. Instead of transferring impacts, it absorbs them. To illustrate how safe the seat is, we’ll make a remark that the seat passed various safety-related procedures. Such procedures include ‘’NHTSA’s Side Impact Test’’ as well as ‘’EU Roll Over Test’’. These tests have the National Highway Traffic Safety Administration seal of approval, so it’s definitely clear what level of safety is in question. Most Pria models have to pass these tests, and this model is no different in that regard. The seat also uses the Air Protection technology and integrates it into its headrests. That significantly increases the protection from side impacts (this will be discussed down below in greater detail). Furthermore, there’s an integration of numerous fail-safe mechanisms. They rely on using different kinds of latches, harnesses, and clips to propel the child and provide safety. Due to its convertible aspect, Maxi Cosi Pria 85 is suitable for both infants and smaller children. Currently, it offers the highest weight range on the market. It’s the only convertible seat that allows you to use it with children's weight that ranges from 5 to 85 pounds. Keep in mind that rear-facing and forward-facing positions use different weight values. For example, rear-facing is suitable for weight range that goes from 5 to 40 pounds while forward-facing goes from 22 to 85 pounds. 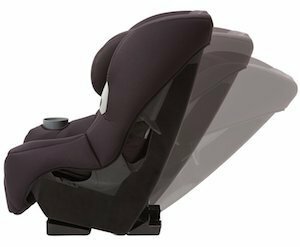 As we tested out the seat, we noticed that rear-facing seat faces some limits when it comes to smaller babies or newborns. The reason for that is simply because babies aren’t tall enough to have their shoulders positioned above the bottom harness slot. Instead, it’s more suitable for older babies who weigh more than 15 pounds. The positives of it regard leg space. It offers enough room for your baby to move his/her legs effortlessly. However, the same cannot be said for older children (who are under 40 pounds). There are a couple of issues there because their legs do not stretch out fully due to the close proximity of your actual car seat. On the other hand, forward-facing works exceptionally well with older children who weight less than 85 pounds. It will serve as a decent seating until your children reach the appropriate weight and height to move on to a booster seat. As far as alternating position is concerned, the biggest downside comes in the form of a difficult conversion. We noticed that it’s a bit challenging to convert the seat from a rear-facing position to forward-facing and vice versa. The manufacturers failed to explain that you have to use the appropriate holes along with a latch. Some people might not know that, which can lead to frustration. The best feature that Maxi-Cosi Pria 85 offers when it comes to fastening accessories is probably its ‘’ClipQuik’’ chest clip. The way it works is by fastening itself using a magnetic mechanism. One of the problems that many parents have to deal with is their children undoing their buckles. With this clip, it’s almost impossible for them to do that due to the way it works. From their position, the angle of the clip makes it harder to release it which is why they can’t do it. To get the clip undone, you only have to squeeze it and then slide it upwards. It’s relatively simple, and you can even do it by using one hand only. To connect it again, you just need to line up the pieces, and it automatically attaches. 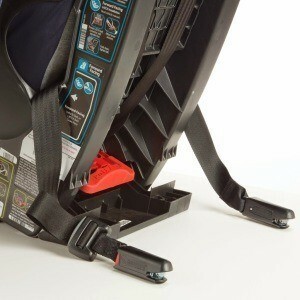 There are side clips as well which can help you keep the main buckle out of the way when you’re buckling in your child. That’s definitely convenient because it reduces the chances of your buckles being poorly fixed. In addition, there’s a customizable infant wedge which can be combined with the infant padding in order to boost up smaller babies. It’s quite firm and ensures that your baby is fixed in place until the ride is over. It’s important to know that the seat straps should fall below your child’s shoulders when rear-facing and above when forward-facing. The design of this seat offers easy strap adjustment. The seat features a one-hand harness micro adjustment system. It’s extremely easy to use. The way you use it is by squeezing the headrest adjustment lever which is placed on the top of the seat. Then, you move it up or down until you reach the desired height, after which you release it. Most parents know how tiresome uninstalling, rethreading, and reinstalling can be. Another interesting point about the adjustment system is that there’s no need to rethread the harness constantly. That is useful when transporting different children, or when your child grows up a bit. We’re quite aware of the fact that children are messy and manage to stain just about anything. That’s why we appreciate the manufacturer’s idea to include a removable cover with their seat. That way you don’t have to clean the seat on the spot or remove it entirely and then clean it outside your car. The only thing that you need to do is remove the cover, clean it, and put it back just as quick. You just have to undo a couple of buttons that hold the cover and then you’re good to go. In addition to being extremely easy to remove and reattach, the cover is also machine washable and dryer safe. 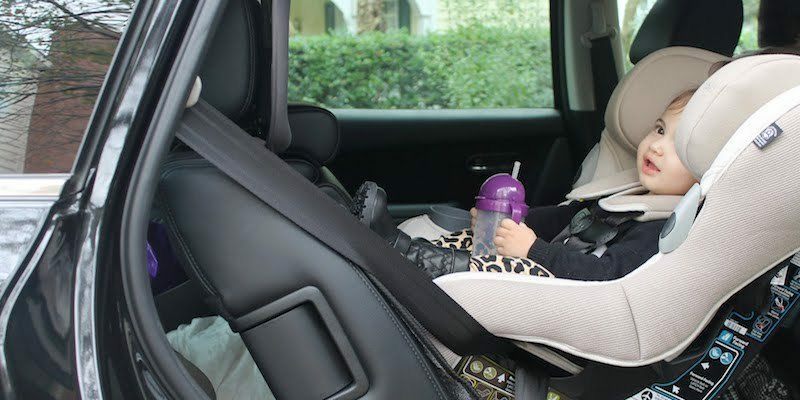 Maxi-Cosi Pria 85 is the only convertible seat that has a dryer-friendly cover. Keep in mind that you should use cold water and wash it on a gentle cycle. We have one minor remark about the cover which regards the harness holders. We think that it would be a lot easier to remove the cover if the holders weren’t there. However, it’s a small compensation for the benefits that the cover brings along. The best addition to Pria 85 is the two side cushions which use the Air Protect technology. They allow more room between the head cushions, but more importantly, they provide an amazing level of protection. The main idea behind the design of the cushions was to eliminate the side impact damage. Furthermore, the rest of the base of the seat is well padded and features soft and comfortable cushions. The cushions are, unfortunately, not washing machine compatible. That might prove to be a problem for people who do not want to sponge the seat by hand. We consider that to be a minor issue since most car seats require uninstallation in order for you to clean them properly. 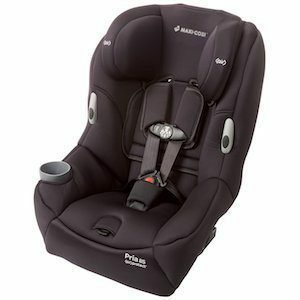 Since we went into details about each aspect and feature of this car seat, we’ll summarize each point down below in the form of a pros and cons list. That way, you’ll have a clearer overlook of everything that Pria 85 offers. The seat is convertible and is suitable for small children. You can use it as a rear-facing or a forward-facing seat. It uses the new Air Protect technology in headrest cushions. The cushions protect your child from side impacts and reduce the chances of disrupting the child’s sleeping. The cover is removable and machine washable. The seat has a one-click chest clip which can’t be undone by the children. It uses a no-rethread harness with nine available height positions. The seat is well padded and ensures comfort. You can use it with children that weigh anywhere from 5 to 85 pounds. It’s not quite suitable for newborns. You need to use a sponge in order to clean the cushions on the seat itself. You can’t clean them in the washing machine. Rear-facing causes some limitations to older children because they can’t stretch their legs out properly. The seat is difficult to convert from rear-facing to forward-facing position. Nevertheless, there is another convertible car seat that you can easily adjust both positions. The installation of the seat is pretty much straightforward. There are two possible ways of installing it. You can either install it along with a seatbelt or a latch. How you install it depends on your child’s weight. Whichever way you choose, keep in mind that you’ll have to go through some necessary steps in order to do it properly. For children who weigh under 40 pounds, use the lower latch anchors. These anchors are usually used along with the rear-facing position. If you have a child who weighs more than 40 pounds, use the seatbelt instead. You should use a seatbelt with forward-facing seat position. An important thing to consider is not to use the tether strap along with rear-facing seat position. Use it only if you want your child to sit in a forward-facing position. Before you actually start installing the seat, you’ll need to determine whether you need the infant cushion inserts. Pria 85 has an infant wedge which you’ll have to use if you have a child who weighs from 6 to 10 pounds. Before you place your infant to determine the height, you’ll have to loosen up the straps and buckles and make sure to raise the headrest. Once you’ve placed your child safely, lower the headrest and fix it. Afterward, you can remove the baby and install the seat in the car. We strongly advise against adjusting the height after the installation of the seat and with a baby in it. Changing the configuration of the seat from an infant to a smaller child is fairly easy (you can consult a user manual about that). On the other hand, changing it from a rear-facing position to forward-facing is definitely not. Something that the manufacturers fail to mention in their instructions is where the latch should go for both positions. If your child is rear-facing the latch should go through the holes that are on the bottom side of the seat’s frame. If the child is forward-facing, make sure that the latch goes through the holes on the back side of the seat. Keep in mind that the straps are permanently connected inside the seat. That means that moving them around might not be so easy as it seems. Maxi-Cosi is a company that always manages to deliver high-quality products with a variety of features. Pria 85 was not different in that regard and most definitely did not disappoint. We’ve read other Maxi Cosi Pria 85 Reviews and concluded that the impressions about the product are mostly positive. To be clear, the seat is far from perfect, but it almost manages to give you everything that you need from a convertible car seat. The company already worked on improving the previous model and will definitely work on improving the seat even more. The seat could use improvements regarding the conversion and appropriation of the rear and forward-facing positions. We think that some cushions and paddings could also be removable as that would make cleaning a lot easier. On the other hand, the seat features a few very innovative elements such as the ‘’ClipQuik’’ chest clip and the Air Protect side cushions. All in all, Pria 85 is a premium seat with a lot of features to it. Being a premium seat, it also has a premium price. That means that it might not be suitable for everyone’s budget.